One of the most common “light-bulb moments” people have as they get older and wiser is just how important good health is. And one of the most common regrets they have is not working hard enough to preserve their well-being when they were younger. You see, the Western world is experiencing a health crisis unlike anything we’ve ever seen. There are many factors contributing to this shocking trend, and sedentary living and poor diet are at the top of the list (and together promote obesity, another major underminer of health). Well, that’s why we at LEGION promote a healthy lifestyle of regular exercise (and resistance training in particular), high-protein dieting with an emphasis on eating large amounts of relatively unprocessed, nutritious foods, and careful and sensible supplementation. To help optimize your mental and physical health beyond what’s possible with eating right and working out alone. That, is, we want to help people already in good health to attain an even higher level of well-being and vitality, and we’ve created several supplements that do just that. 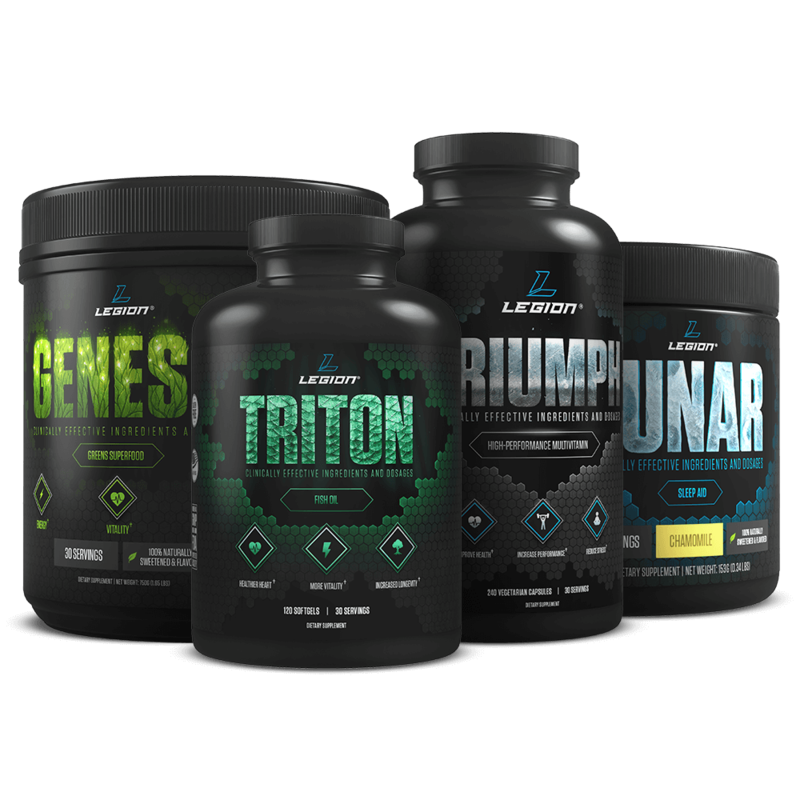 Specifically this stack is comprised of 4 supplements that provide you with 24 essential vitamins and minerals plus 29 additional ingredients scientifically proven to enhance just about every facet of your health that you can imagine. Less joint inflammation and pain. The Optimal Performance Stack is also unique in that you simply can’t get the majority of these powerful substances from your diet alone. For example, I doubt you eat much spirulina, maca, aged garlic extract, curcumin, or CoQ10. That’s why we feel this is the ultimate collection of “nutritional support” supplements that are truly supplemental to a healthy diet and can benefit people that eat and live well. The bottom line is if you want to see just how big of a difference there is between good and great health...just how better you can look, feel, and perform when your body is firing on all cylinders...then you want to buy the Optimal Performance stack today. TRITON is a high-potency, 100% reesterified triglyceride fish oil with added vitamin E to prevent oxidation and rancidity. It’s also made from sustainably fished deep-water anchovies and sardines and is molecularly distilled to remove synthetic and natural toxins and contaminants. Fish oil is one of the most popular supplements in the world because it provides your body with two essential fatty acids that affect everything from heart health to immunity to cognitive function, muscle building, fat loss, and more. These fatty acids are eicosapentaenoic acid (EPA) and docosahexaenoic acid (DHA), and if you’re like, well, most everyone, you’re not getting enough in your diet and can benefit greatly from a fish oil supplement like TRITON. Life is just better when you can play hard and feel good, and that’s why GENESIS was formulated to boost and optimize whole-body health and vitality. It isn’t just another mediocre blend of fruit and vegetable powders, either. It provides you with a select mixture of vegetables, superfoods, adaptogens, herbs, and other phytonutrients that are proven to boost general immunity, heart and circulatory health, energy levels, libido, mood, overall well-being, and more. Good sleep hygiene is a like a good exercise routine: it improves your life in just about every way. That’s why we created LUNAR, which contains clinically effective dosages of 4 natural, safe, and non-habit-forming ingredients that are scientifically proven to help you fall asleep faster, enjoy longer and deeper sleep, and wake up feeling rested and rejuvenated, not groggy and lethargic. Take TRITON at the same time as you take TRIUMPH, which should be after one of your larger meals of the day. This will help with the absorption of the nutrients in TRITON and prevent any nausea or gastric distress that some people experience when taking fish oil on an empty stomach. As with TRIUMPH, you can increase absorption by having GENESIS with or after a meal containing dietary fat. We recommend you have GENESIS early in the day as many people experience a noticeable increase in energy and mood. GENESIS tastes particularly good when mixed with one to two scoops of our vanilla WHEY+ protein powder. Blend it all up with a banana and you have a delicious greens smoothie! Lunar can be used daily without harm, but by using it less frequently, you will maximize its effectiveness. We recommend that you use Lunar up to three times per week on nights where good sleep is particularly important.